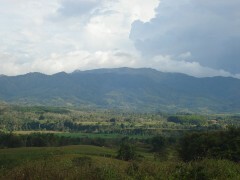 Description: While not very well known, the Pantaron mountain range in Bukidnon is a haven of biodiversity. Various species of threatened endemic fauna seek refuge within the vital watersheds that this mountain range hosts. High incidence of poverty and tenurial issues are strong influences on the lives of the indigenous Manobos or Lumads, who rely largely on the natural resources of the range. One of the Mindanao's few remaining tropical rainforests that holds several watersheds vital to the survival of Mindanao's biodiversity. The mountain range is bounded by Bukidnon, Misamis Oriental and Agusan del Sur in the north, and Bukidnon and Davao del Norte in the south. The Manobos or lumads are the inhabitants of the range.